The bottling of cask number 2966, a Pedro Ximenez sherry puncheon, was voted Winner in the "Over £80" category, top Distillery Bottling and also won the big award – the coveted "Whisky of the Year" for 2012. In a further accolade for the Aberdeenshire distillery, two other expressions – the GlenDronach 18 yo Allardice and the 21 yo Parliament – were both nominated in the "£35-£80" category, earning strong endorsements from the judging panel. It’s the twelfth year of the awards in which forty-five of Scotland’s top whiskies went head to head to be crowned Whisky of the Year. The Whisky Challenge team said: "Now in its twelfth year, the Scottish Field Whisky Challenge has firmly established itself as a credible guide to Scotland's very best whiskies as well as an event that is eagerly awaited by connoisseurs and whisky enthusiasts alike." This year the judges, drawn from some of the top independent whisky retailers in Scotland, were Darren Leitch, Duncan Ralph, Mark Angus, Julie Trevisan Hunter, Mike Lord, Mark Connolly and Robin Russell. And they were unanimous that the GlenDronach 22yo was an outstanding winner. In the knockout round in the morning session, all seven voted that it should go forward to the afternoon session. Normally at least one judge demurs so for all to agree is extremely rare. 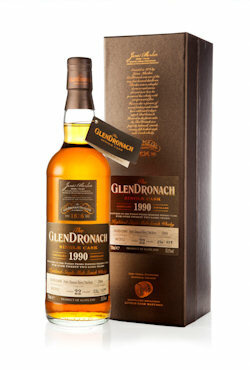 Distilled and filled to cask on May 30, 1990 and bottled in June this year as part of GlenDronach single casks' “Batch 6”, the 1990 cask # 2966 is aged 22 years old and has been bottled at cask strength (55.1% vol). The cask produced just 539 bottles which retail in the UK at approximately £95.99 per 700ml.